A Syrian army soldier stands next to a Syrian flag in Umm al-Mayazen, in the countryside of Daraa, Syria, July 10, 2018. 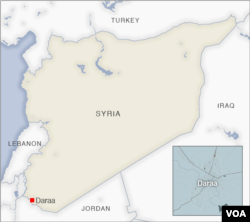 Arab media reports that Syrian government forces have taken control of all of the country's southern border with Jordan, surrounding remaining rebel forces in one corner of the city of Daraa, where the revolution against President Bashar al-Assad erupted in March 2011. Syrian state TV showed residents of the Daraa suburb of Oum al-Mayaden cheering government forces after they took control of their town Tuesday. A middle-aged resident told journalists he is pleased the Syrian Army had taken control, restoring peace and security to the area. Arab media reported Syrian government troops had taken all of the border area with Jordan and surrounded remaining rebel forces inside one district of Daraa. Rebel commanders complained Russia and the Syrian government had broken an agreement for them to peacefully disarm. Opposition analyst Rami Abdel Rahman of the Syrian Observatory for Human Rights told al-Arabiya TV Syrian government forces were attempting to capture the final pocket of Islamic State militants near the border with the Israeli occupied Golan Heights. Syrian government media showed photos of what it claimed were Western-made rockets and other ammunition handed over by rebel fighters when they agreed to disarm. Syria expert Joshua Landis, who heads the Middle East program at the University of Oklahoma, tells VOA the Syrian government is putting an end to the last independent rebel militias around Daraa, which in effect signals the death knell of the revolution against President Bashar al-Assad that began in 2011. "This is the end of the revolution, so there will be a new phase, because once the south is finished and consolidated, or more or less consolidated, the regime is going to move its best troops up to Idlib province and it is going to want to take back as much land as it possibly can from Turkey and we do not know how this is going to work out, because Turkey is not going to allow the Syrian Army to drive the tens of thousands of rebels who have collected in Idlib into Turkey," he said. Landis says U.S. envoy Brett McGurk has called Idlib "the biggest collection of al-Qaida forces seen since 9/11." Rebels from other parts of the country were allowed to gather in Idlib as part of an agreement with Syria's government to evacuate areas they formerly controlled. In other developments, al-Arabiya TV reported U.S.-backed Kurdish YPG militia fighters had surrounded Islamic State militants near Deir ez Zor in the east of the country. In Tehran, Iranian Revolutionary Guard deputy commander Hossein Salami claimed his forces were putting together a so-called "Islamic army" to fight Israel near the Golan Heights. Syrian media reported on Monday that Israeli planes bombed the large T-4 airbase, outside of Homs. Saudi-owned al-Arabiya TV claimed several Iranian advisors or pro-Iranian militia fighters may have been killed in the raid.